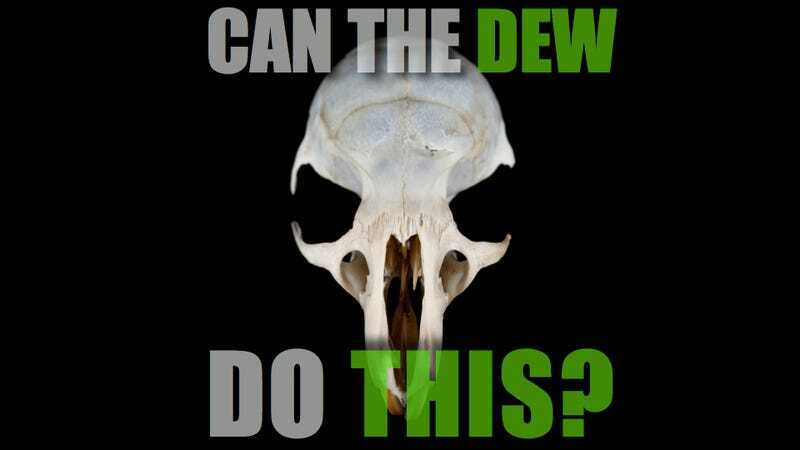 Can Mountain Dew really dissolve a mouse carcass? An attempt to win a small court battle this week has put Mountain Dew in peril of losing a much larger war. PepsiCo, the soft drink's parent company, defended itself against a man who claimed he found a dead mouse in a can of the citrus soda. Experts called in by PepsiCo's lawyers offered a stomach-churning explanation for why it couldn't be true: the Mountain Dew would have dissolved the mouse, turning it into a "jelly-like substance," had it been in the can of fluid from the time of its bottling until the day the plaintiff opened it, 15 months later. Forget legal disputes over canned vermin. The new question has become: Is Mountain Dew really so corrosive that it can dissolve a mouse carcass? And if so, what does it do to your teeth and intestines? Is Mountain Dew's classic slogan - "It'll tickle yore innards" - the world's most sickening understatement? Key to Pepsi's legal argument is that there's no chance a mouse's corpse could survive, intact, for 15 months swimming in Mountain Dew. While published studies have not been conducted on how rapidly Mountain Dew would dissolve a mouse, there is plenty of evidence to suggest that the neon green soda can eat away teeth and bones in a matter of months, and would likely do quite a number on a rodent. "I think it is plausible that it could dissolve a mouse in a few months," said Yan-Fang Ren of the University of Rochester School of Medicine and Dentistry, who has studied the effects of citric acid on bones and teeth. "But dissolving [the mouse] does not mean it will disappear, because you'll still have the collagen and the soft tissue part. It will be like rubber." According to Ren, Mountain Dew contains citric acid, a substance naturally found in citrus fruits that exists as a powder in its purified, industrialized form. Most citrus sodas mix in the stuff to give drinks their tangy bite, while most colas, such as Coca Cola and Pepsi, incorporate phosphoric acid for the same effect. Consequently, these drinks have a low pH value around 3 (very acidic). Coca Cola, with its dark coloring and non-fruity flavor, may be the soft drink most often compared to battery acid, but in 2004, a well-known study led by dentist J. Anthony von Fraunhofer found that citrus sodas like Mountain Dew and Sprite erode tooth enamel around six times faster than colas. Citric acid in Mountain Dew would eat away a mouse's bones in a similar manner as it erodes teeth, breaking down the chemical bonds that hold the tissue together by infiltrating them with positively charged particles. "The acid also has a 'chelating effect' - it can combine with calcium in the bones, taking it away quicker," Ren told Life's Little Mysteries. Your stomach and intestines, however, are built to withstand a variety of acidic digestive juices. For people with healthy digestive tracts, a little extra acid from Mountain Dew, which passes through your system relatively quickly, shouldn't harm your stomach like it does your teeth. Defenders of Mountain Dew sometimes argue that orange juice contains as much or more citric acid as the neon green soda. "It's basically true," Ren said. "The pH of orange juice is between 3.5 and 3.8 - also very acidic. From what our experience is, yes, the rate of decay would be the same." However, juice presents a small tradeoff: It erodes teeth, but it also provides vitamin C. "Orange juice has a healthy aspect, so people should continue to drink it," Ren said. He suggested minimizing the contact between the juice and your teeth by taking large gulps rather than small, frequent sips, then washing your mouth out with water. Or, you could use a straw. Unlike orange juice, Mountain Dew contains no vitamin C… and, if you're lucky, no rubbery ghosts of mice, either. This post originally appeared on Life's Little Mysteries. Top image via Shutterstock. Mouse w/ Dew via.